I’ve been following Xmos and their great multi core microprocessors for over a year now and a recently listed project recently listed on XMOS community site caught my attention. The XShell (and XGS) project is a minimalist computer with 32M bytes of SDRAM and complete with VGA, keyboard and SD card interfaces. On the software side it offers a simple shell, editor and interpreter making a basic computer system. Nothing spectacular there you might say, it sounds like a basic DOS PC from the very early 90’s but what is awesome apart from the RAM the entire computer is executed in software on a single microprocessor chip with no dedicate interfaces! That’s right, only software is used to generate the VGA screen as well as all the other interfaces: keyboard, 1-bit audio, SD card interface and joystick. One the first things that struck me about this was it would be a great canidate for the $10 computer for developing countries. Yvo of xcores.org has been busy again. His website is showing his progress on a NTSC TV driver with 512 colours. Heres hoping he can be persuaded to do a PAL TV driver once the NTSC driver is put to bed. and includes a USB based XTAG-2 Debug Adapater. Its not yet listed onXmos’s website but I’m sure it’ll be there soon. Seeedstudio have been teasing users on the Ardunio forum with advance product news of a really cool pocket DSO. The DSO mobile is a pocket size digital storage oscilloscope base on ARM Cortex™-M3 compatible 32 bit platform, equipped with a 320*240 color display, SD card interface, USB connection, chargeable batteries and weighs only 60g! If it’s spec is half as good as it looks I know what I want for Christmas. Yvo of xcores.org has released his preliminary VDP source code for the Xmos XS1 processor. All this on a single chip with no dedicated video graphics controller in sight. I hope Yvo releases the source code and hardware details soon, so I can have a fire up my Xmos development board and have some fun. Who knows it could snowball into another Uzebox or Xgamestation like community collaboration. Lets hope so. The guys (and girls) at Liquidware (of Illuminato Arduino fame) have announced the Illuminato X Machina a small ARM based Arduino like platform that can be interconnected to other X-Machinade to form a cool networked computing cluster. 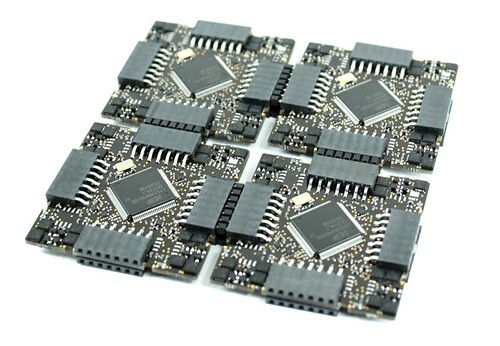 Each small square board has its own ARM Cortex M3 microcontroller giving each board its own processor, program memory, data memory and I/O. Each board can also interconnected to other Illuminato+X+Machina boards on one or more of its four sides. This idea of parallelism and closely coupled processor interconnection reminds me of the Transputer from the eighties. The concept of the Transputer lives on in the recently founded (in 2005) Xmos and their multi-threaded multi-core processor with integrated interconnection switches. You are currently browsing the Zuzebox's Blog blog archives for September, 2009.